My mum’s mother had escaped the Russian Revolution as a child. Mum herself was born in 1930 in a village outside Danzig when it was a Free City-State, so in that sense she was truly a child of the whole world, not constrained by national boundaries. When she was three the city’s government was taken over by the Nazi Party, and when she was eight the Free City was abolished and became part of West Prussia. With her parents and her sister (my aunt, Tamara), she moved to Germany and settled in Dusseldorf. Life wasn’t smooth there – she spoke of the war very little but did tell of the time she watched terrified through the primary school window as Allied pilots strafed bullets at the younger children in the school playground. Undoubtedly the difficulties facing innocent families during the war were no different in Germany than in England. Aged 18, she left Germany and travelled by sea to Canada, and found a job and a flat in Toronto, and rapidly improving her English language skills. There, in 1950, a stunningly beautiful young woman, she met a young television editor called Tony Essex. They married in Toronto in December 1954, and the following year she became a citizen of the United Kingdom and Colonies, swearing the oath of allegiance to the High Commissioner of the United Kingdom in Ottawa. The certificate, which I still have, includes the line “I declare I am an alien …” – we can only hope things have moved on slightly since those days. After a stay in New York, they sailed to England in 1956. Mum definitely came from the generation that had to work hard for everything. They lived in a tiny upstairs flat in Finchley where she had to carry my brother Peter and his pushchair up several flights every day, and the first meal she cooked for my dad was boiled eggs cooked in a kettle because they didn’t have a saucepan. But she always described those days as the best of times – laughing together over her cooking disasters, scrimping and saving every penny, and having enormous fun. Her second pregnancy, combined with dad’s increasing success as a highly-acclaimed producer at the BBC, led to their first house in Ealing. At last things became a bit easier for her – and fortunately both my brother and I were beautifully behaved and almost no trouble at all! The travelling wasn’t over. In 1965 the family moved to Yorkshire where Dad was one of the founders of Yorkshire Television. Then in 1973 a bigger move – this time to Sydney, Australia, to make Dad’s next TV drama series. It was on their return to London in 1975 that my father died tragically early of a heart attack, leaving Mum widowed at just 44. This led to a move to Buckinghamshire then quickly to Berkshire, where she buckled down to a secretarial course and began work at the German company AEG Telefunken. They undoubtedly expected her language skills to be of use to them, but the first time she was asked to speak to the German boss at head office in Berlin, she discovered she had forgotten every word of German and they had to send her on a beginners’ course! It’s so easy for our generation – whichever generation – to imagine we are the ones with the exciting lives, we’re the ones doing it all, and we fondly imagine that our elders are watching from their rocking chairs, wishing they could travel and have such excitement. It’s rubbish, of course. If I live to be 100, I won’t pack into her life even a fraction of what my mother fitted into hers. Mum and I began a series of adventurous holidays together. 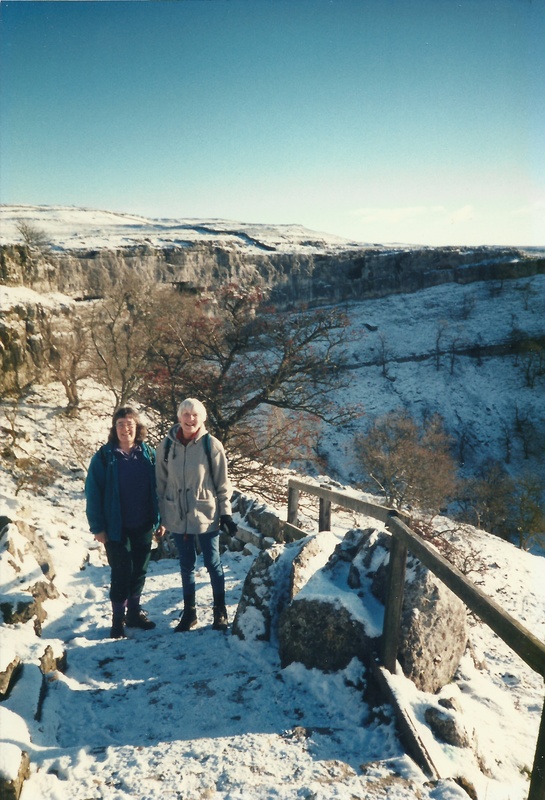 We started in the 1970s by going off bed and breakfasting in every corner of England, Scotland and Wales, while Dad spent the weekends at our Yorkshire home writing and editing TV scripts. We never bothered to book accommodation, just set off with a map and a toothbrush to discover new counties. 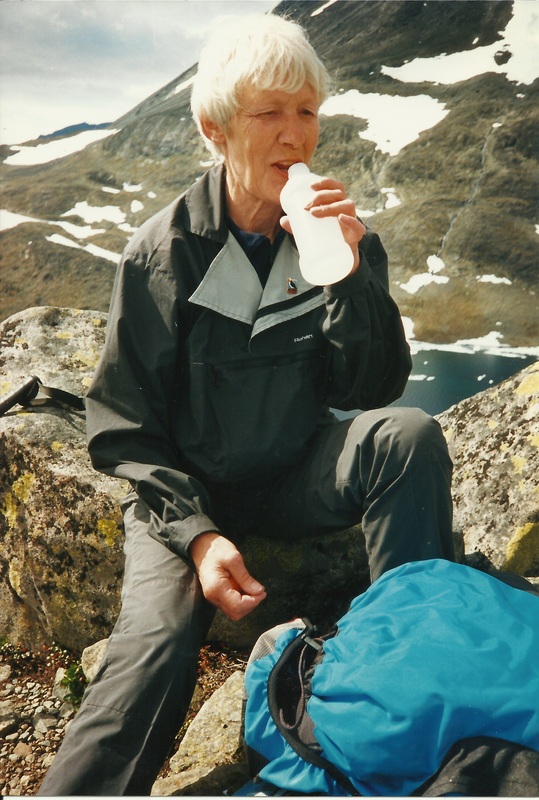 I n the 80s and 90s Mum and I visited Italy many times, France, and then an epic trip above the Arctic Circle through northern Norway – where Mum stood on the Norwegian border gazing into Russia, where her own mother had been born. She hadn’t lost her love of walking, and celebrated her 60th birthday by giving up smoking and walking the West Highland Way with me. In her last two months, when so many more recent memories were difficult to capture, any reminder of one of those holidays prompted a clear memory and details easily recalled. In 2005 she moved to Shaftesbury to be near me. The walking trips were replaced with slightly more sedentary trips, exploring Dorset and discovering many wonderful pubs and tea shops. When she received her Disability Living Allowance, she re-named it her Disability Lunching Allowance. Being unconvinced that she really deserved it, she decided to spend it wisely on delicious pub lunches – with me as her more-than-willing chauffeur and companion. Sunday was Scrabble day, when Mum and I would be locked in battle searching for the elusive 7-letter word. We each won about as many games as each other, until finally tiredness led Mum to push the board away unfinished during the last game we played together. For me the days of lunch-trips and Scrabble seem very recent. 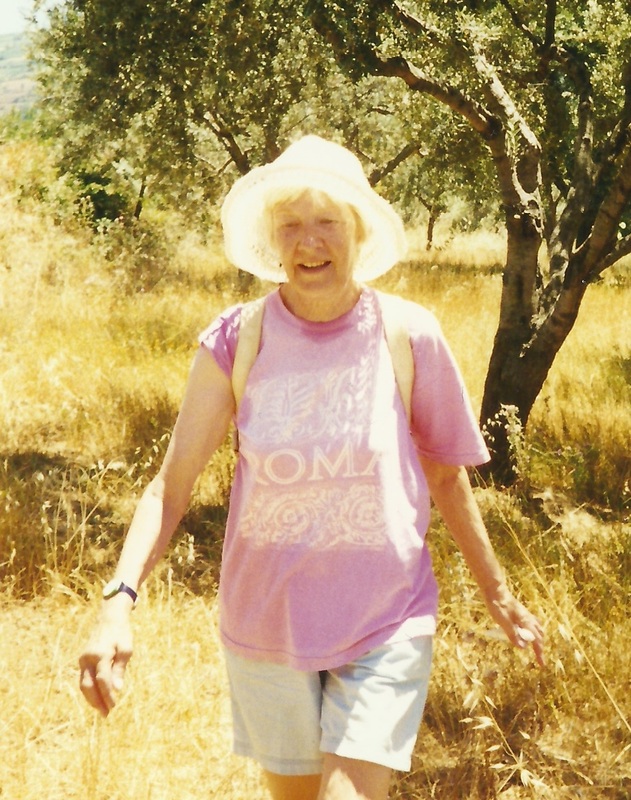 Mum’s last year was difficult and painful, but borne with her trademark stoicism. Fortunately her final illness was short, and the exceptional care of the local GP practice and particularly the staff of Westminster Memorial Hospital in Shaftesbury kept her comfortable and free from pain until her death on June 4th this year. It was a life full of extraordinary experiences, though she spoke very little of these. It was a life full of delight in the smallest things – like spitting cherrystones at the puffins on the Scilly Isles, the fresh crab sandwich served from a fisherman’s kitchen window on the Northumbrian coast, and picking a sun-warmed lemon from a tree in Southern Italy. My mum – Ingrid Essex – born without nationality or boundaries. A traveller, a walker, and an inveterate luncher. A life lived to the full. A life well worth living. This entry was posted in Dorset, Spain and tagged Andalucia, Dorset, Mum, Shaftesbury, SpanishBlog, Tamara Essex by tamaraessex. Bookmark the permalink. What a beautiful tribute to your mum, and to your relationship with her. I’m feeling quite tearful now! Treasure those memories…. That´s a wonderful tribute, Tamara. Beautifully written.